This morning saw another fast OeBB Railjet ride from Salzburg to St.Poelten, then a regional train to Krems and a taxi ride to Duernstein. We were in the Wachau. 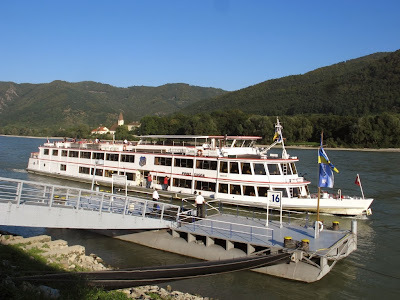 The Wachau is a valley formed by the Danube river and lies midway between the towns of Melk and Krems. It is 40 km in length and was already settled in prehistoric times. The elegance of its ancient monasteries, castles and ruins combined with the distinct urban architecture of its towns and villages and the cultivation of grape vines as an important agricultural crop are the dominant features of this area. 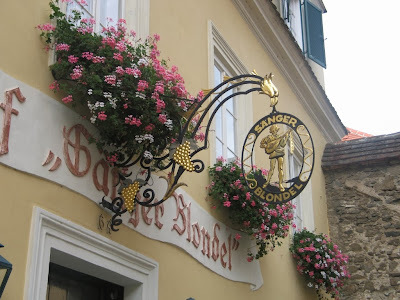 Our accommodation was the Gasthof Saenger Blondel in the centre of the town right under the blue and white baroque steeple of the monastery church. 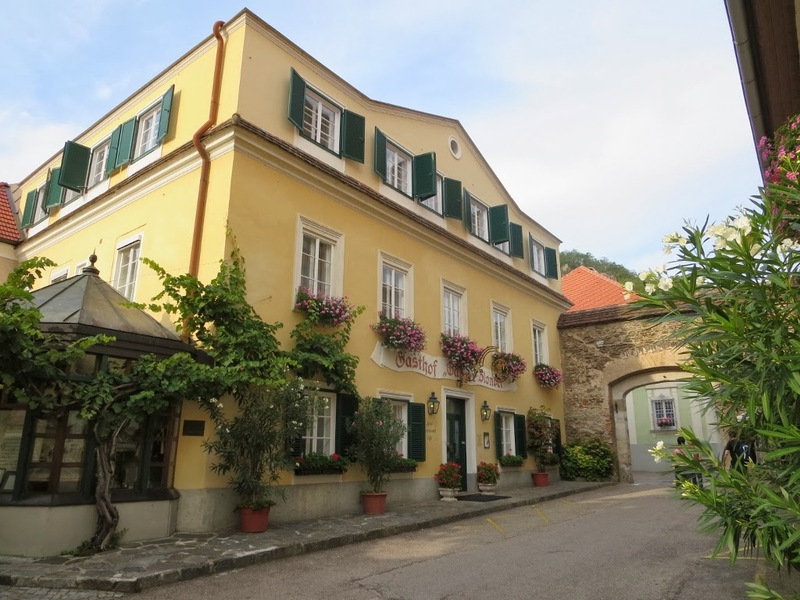 The hotel's name translated as "Minstrel Blondel" comes from the fact that Richard the Lionheart was held hostage in the castle above Duernstein in 1192 when returning from the Crusades. The minstrel had wandered Europe looking for his friend, the king, and eventually found him here, as legend would have it, by singing a song familiar to both of them. A hefty ransom was paid and Richard released. We spent the afternoon wandering around the town with the myriad of other tourists who arrive by car and bus or by river boat. The village has a population of around one thousand but during the day there seems to be over double that. At around 5pm, however, the place empties out and returns to some semblance of quiet. We had booked dinner at the hotel which turned out to be an excellent choice. Tables had been set up in the lovely garden, a zither player supplied music and the food and wine were just great. Herr Schendl and his wife and dedicated staff do a great job at this establishment. The next morning started with some drama. 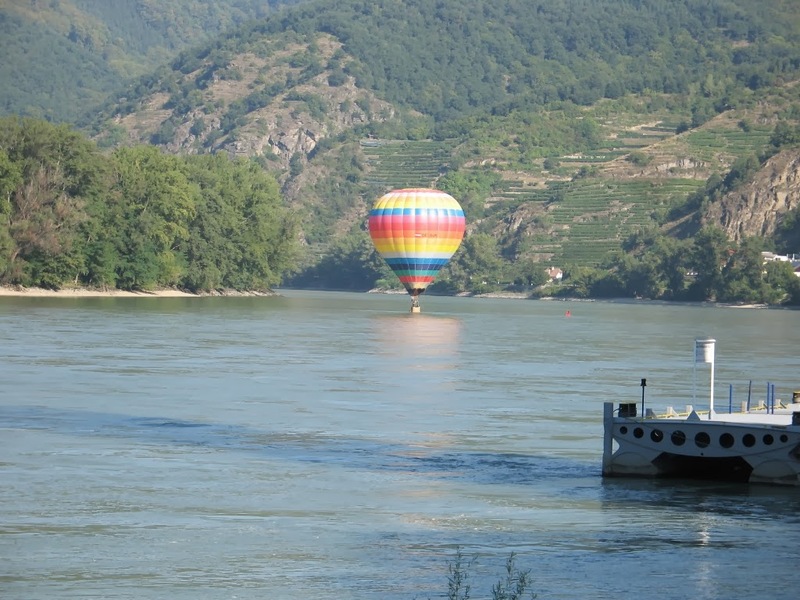 We were waiting for our river cruise boat when suddenly a hot air balloon made an appearance and landed in the very swift flowing Danube. There seemed to be some action in the basket with a person going overboard. 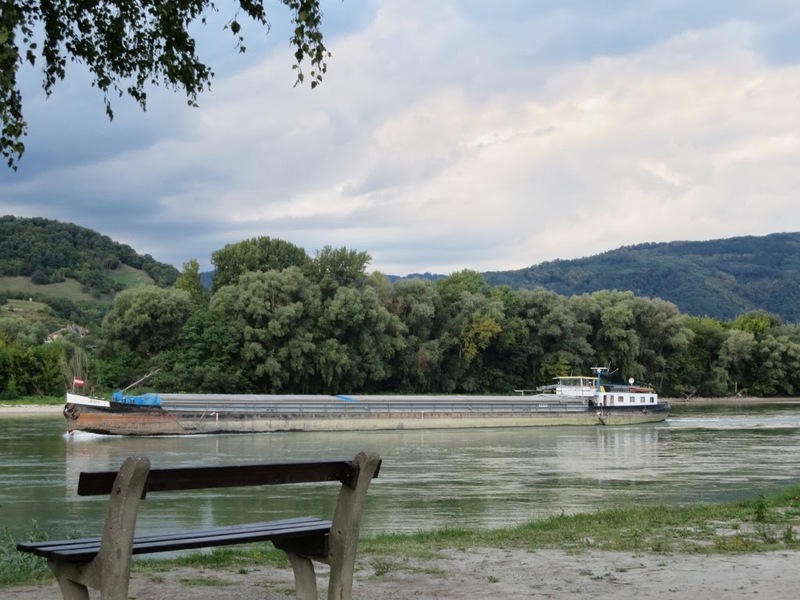 Within minutes the police had arrived by land followed soon after by water police, rescue boats, fire brigade and a helicopter. By this time the balloon had taken off again and landed over some trees on the opposite bank. We read later in the local paper that the early morning tourist flight had gone wrong with a burner malfunction. The three passengers and pilot were not injured. 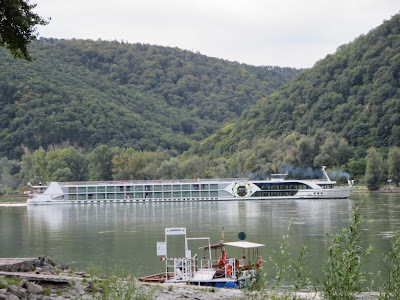 Our boat, MS Prinz Eugen arrived and we headed upstream to Melk. The boat is around 64m long and has a capacity of 600 passengers. Today there were a lot less making it a very comfortable ride. And time for a few glasses of wine too. A very pleasant journey upstream with the villages, castles and vineyards passing by. From the Melk wharf we walked through the old part of town and climbed up to the Benedictine Abbey. Lots of people around being a weekend. We decided to have an early lunch first at the abbey restaurant to beat the crowds. It turned into a bit of a long affair with some good food, good wine and plenty of warm sunshine. Beautifully cooked fish followed by apricot dumplings. The Wachau is famous for apricots and they seem to be able to make something to eat, drink or apply to the body from all parts of them. Even the stone kernels are sold roasted. The dumplings are a specialty. Sorry, not for us though. A little stodgy. 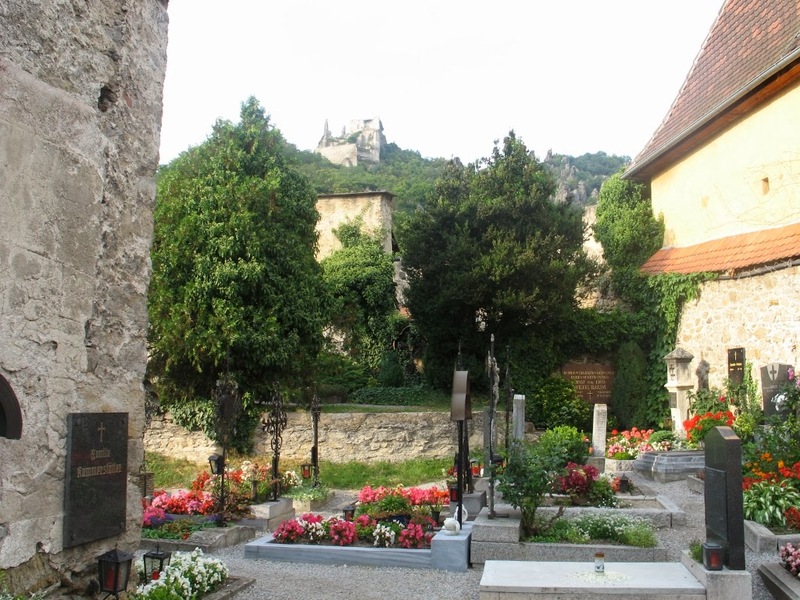 We realized at the end that we didn't really have time to visit the abbey itself before our boat left for the journey back to Duernstein. O well.....we had plenty of days left to come back. It was an equally pleasant and obviously quicker journey downstream with the boat almost deserted. 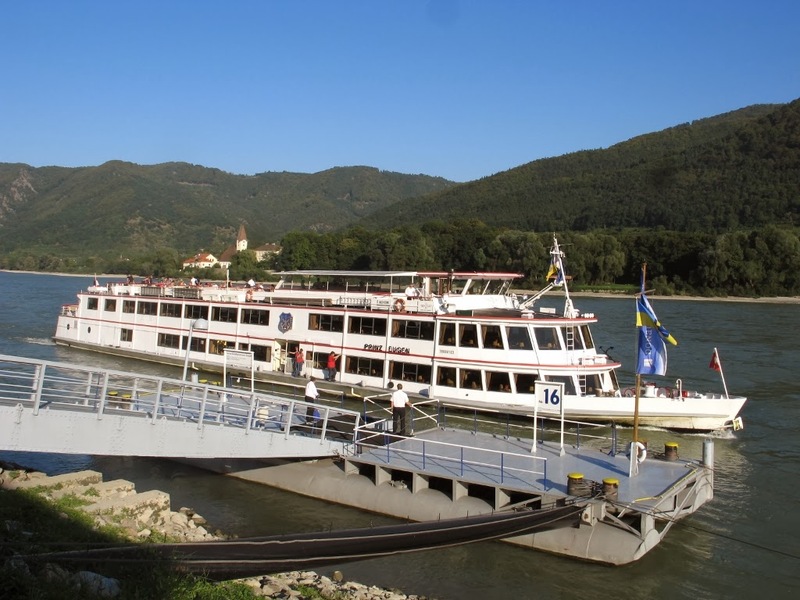 Most of the upriver passengers had been picked up by bus in Melk and were now on the next leg of their Europe in 14 Days tour. Obviously Austrians can't enjoy a Sunday sleep in either. Church bells at 6am???? We did say the Abbey's church steeple was right next door to our hotel. Later that morning, the small town square had been cordoned off and the post church crowd had gathered to listen to a local band play Strauss and drink (free) wine. 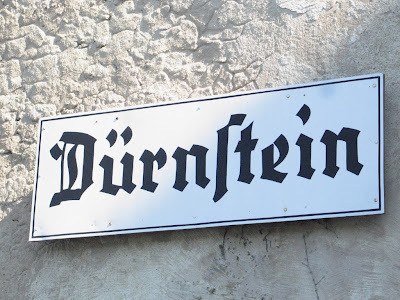 Many of the locals were in traditional dress (dirndl for the women, lederhosen for men) which seemed the norm for the rural areas we visited. Nice to see that continuing. 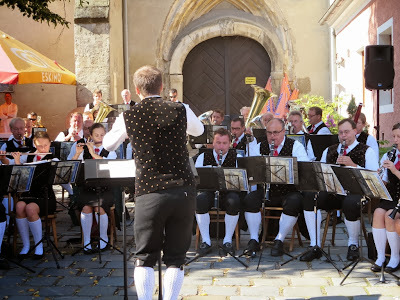 We walked a short way out of town to Domaene Wachau, the largest wine producer in the area. While many small producers grow their own grapes and sell their wine through their own heurige, this winery has access to grapes from all over the Wachau and it was a chance to taste the influence of the various 'terroirs' on the varieties grown there, mainly Gruener Veltliner and Riesling. 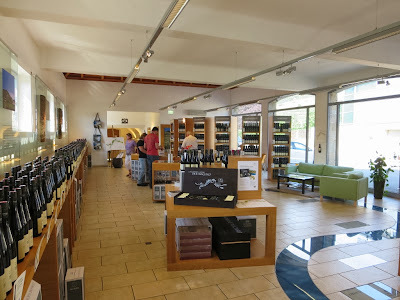 Domaene Wachau had a very nice set up and a lovely lady, Brigette, took us under her wing for a tasting although we initially explained we could not buy much as we were travelling. She said we had come "such a long way" it would be no problem to give us a rundown on the wines we were interested in. We spent a very informative and pleasant hour or so there and eventually bought three bottles 'for the road'. Two we drank on the river bank on the following late afternoons and the other we took to the USA to share. 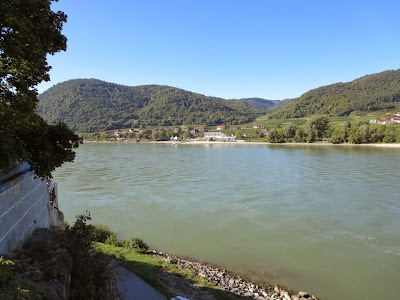 More on the Wachau wine scene in a later post. We found a very nice heuriger, Stockingerhof for lunch. Wild boar sausage and kraut plus apricot crepes and some of their own excellent wine. The 'thing to do' in Duernstein, as a tourist, is to hike up to the ruins of the castle. 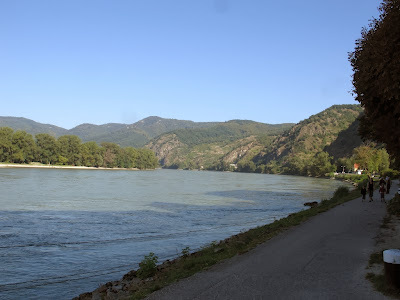 It is apparently quite a climb up a rough track and although the ruins are not that exciting, the view over the Danube valley is said to be worth the effort. We had seen many tourists returning from this trek. Some did not look in very good 'condition'. That and the unseasonably warm weather convinced us to stay within the confines of the town. We explored more of the village, coming across an old church and its very small but immaculately kept graveyard. 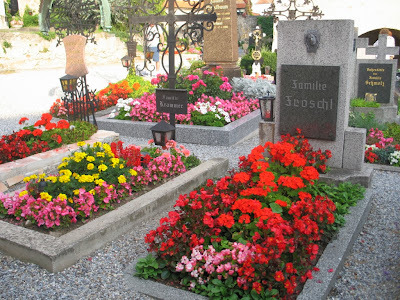 However the cemetery is so small that the grave sites are rented. 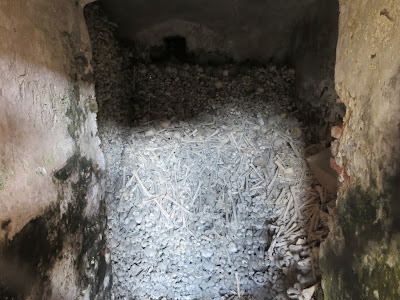 When a family dies out, the bones of the occupant are removed to an ossuary and a new 'tenant' takes over the site. With that example of how brief life's (and indeed, afterlife's) tenure can be, we took a bottle of cold Riesling and our plastic cups and 'retired' to a seat on the river bank during the late afternoon, watched the tourists returning to their luxury cruise boats moored down river and to the car/bus parks, the river barges making their way up or down river, the last small ferries making the crossing to the other side and the odd jogger or walker enjoying the last of the day's sunshine.